Aloha! My name is Jason Meehan. I was born and raised in Orlando, FL since August 31, 1981. You could find me in the water and sun since I could crawl. My uncle taught me how to surf when I was 9...and that's when I fell in love with board sports. I was introduced to stand up paddling in 2009. 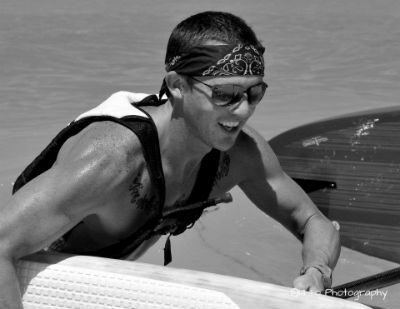 Charging the surf on the east coast of Florida to racing it in my first SUP race in 2009. That was the first time I had ever seen a SUP race! I've been hooked ever since. I race a 2013 Starboard Brushed Carbon 14’x26” “All Star” and a Brushed Carbon 12'6x25” “Sprint”. My surf SUP is an AST blue 6'6"x30" “Impossible”. I am also a certified personal trainer and fitness/Surf instructor, and an ASI certified SUP instructor as well. Through tours, clinics, and classes I get people stoked on healthier lifestyle habits and having fun, while getting fit. I also teach elite race training clinics, provide advanced SUP surf and surf instruction and I lead most of our social paddles conducted weekly in Orlando. I’m really pushing the limits with my progression as a competitive paddler. I have some awesome sponsors at Travel Country Outdoors, Werner Paddles, Hinano Tahiti, Pocket Fuel Naturals, Maui Jim and Starboard SUP. They have given me so much support in all my endevours. I live this SUP & board sports lifestyle to the fullest and will always be a part of it, because it’s what I love and where my passion is. I try to always spread aloha spirit to everyone I meet and in everything I do! Mahalo!